Peter Gidal is a renowned filmmaker, writer and theorist who has exhibited films internationally for the past 40 years. This limited edition DVD presents a rare performance by Gidal in which he interrogates his own practice as an experimental filmmaker and theorist via Brecht's theatre theory, plus two of his key later film works and a new text work produced by Gidal to accompany the performance. 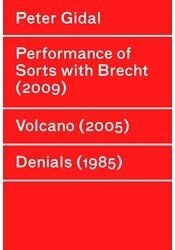 “Theatre theory for film, or not: Brecht (an interrogation/performance: a ghost trio for two).” (Gidal). Taking the form of a multi-part dialogue in which Gidal’s translations of Brecht are spoken, Gidal stages an interrogation of his own practice as an experimental filmmaker and theorist via Brecht’s theatre theory. Without rehearsal (but with practice), Gidal “replied” and counter-interrogated on the night. Performance of Sorts with Brecht, Peter Gidal with Karen Mirza was presented by no.w.here as part of the series Reverberations in collaboration with Chisenhale Gallery on 8th June 2009.
questions of aesthetics, what it is to view, how to view the unknown as to view the known is not possibly a viewing. The question of recognition, the impossibility of recognition or, better said, the impossibility o f a viewer viewing at all if it is predicated up on recognition... at that moment, you the viewer I the viewer am no longer part of a process, a material however metaphysical or not process of making meaning through the conflicts of perception of something... in this film volcano light’s afterimage, the shot of light after image, becomes as obliterative as dark’s... thereby the temporal break caused by transparent leader, and by black leader, becomes differently spatial and temporal, as to the “something missing”... and there are or are meant to be in all this particular, specific differences to be experienced in the “breaks” and “interruptions” caused by light versus those caused by darkness... in relation to specific film questions of space, questions of time... for example in relation to lacunae (emptiness), nonlacunae (the represented real)... such philosophical aesthetic involvements... nothing is “missing ” except the ability to “cohere” a viable realism... From a statement by Peter Gidal, 2003 . Hopefully learning the lessons of Close Up, the attempt was to construct the discrete form the (seemingly) continuous... so that, mainly retrospectively (yet during viewing) sequences present themselves as fragment-conglomorates. Therefrom might come questions of 'natural representations'..Filmic assumptions of evidence lacking, desired voyeurist pleasures could be turned into thought. Realism of another kind. - P.G. 1986. Filmed in Vienna.